Air Force considers options for major R&D initiative | New cost estimate due in June on next-generation ICBMs | Air Force looks to spark innovation with "vanguard programs"
Global persistent awareness, resilient information sharing and rapid decision-making are potential areas of interest for Air Force research investment. The Air Force is planning to spend some $560 million on major advancements. Poland is Buying. Where are You Selling? 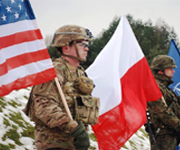 In the face of a resurgent Russia, Poland is budgeting more for defense, and the U.S. is its preferred supplier. The USA has been named the "Lead Nation" at MSPO 2019. Make MSPO your next big show, and take your best shot at big defense and security deals in eastern Europe. Despite significant variances in program estimates and regardless of the contractor selected, Gen. Timothy Ray says the overall cost of maintaining future intercontinental ballistic missiles will be much lower than the current amount. "Between the acquisition and the deal that we have from a competitive environment, from our ability to drive sustainment, the value proposition that I'm looking at is a two-thirds reduction in the number of times we have to go and open the site," he said. Reports suggest a new cost estimate will be delivered by the Pentagon in June. Air Force looks to spark innovation with "vanguard programs"
The Air Force plans to pursue "vanguard programs" to develop and field capabilities of the future. They will be guided by a yet-to-be-named Air Force chief technology officer. The Defense Department is investing $10.5 billion to field hypersonic weapons in five years. Air Force hypersonic weapons will be launched from Boeing B-52 aircraft. Third-party networks have hidden vulnerabilities, what are yours? Be alerted to sudden lapses in quality that could compromise a supplier's control systems. Click here for a free Download of KPMG's Top 5 Third-Party Risks. Take action against the threats to your business success. The European Commission is considering new customs duties on US civilian aircraft in response to potential US tariffs on Airbus planes. "While we need to be ready with countermeasures, in case there is no other way out, I still believe that dialogue is what should prevail between important partners," European Trade Commissioner Cecilia Malmstrom says. Boeing has selected Cubic Mission Solutions to provide communications systems for the MQ-25 tanker drone. "The MQ-25 program is vital because it will help the US Navy extend the range of the carrier air wing, and Boeing and our industry team is all-in on delivering this capability," Boeing's Dave Bujold says. A Cygnus spacecraft successfully reached orbit Wednesday, launched by a Northrop Grumman Antares. The cargo spacecraft is on a resupply mission for the International Space Station. To meet its accelerated timeline for a crewed moon mission, NASA will require budget increases from Congress. Team America Rocketry Challenge announced the teams competing at the National Finals on May 18 at Great Meadow in The Plains, Va., outside of Washington, D.C. This year, two teams tied for the 100th spot, so 101 teams will compete in the finals based on their qualification scores. Read more here.